The Chapmans offer heartwarming stories and thoughtful prayers to inspire you: a schoolboy discovers a safe haven (God, I pray my grandchildren will know love instead of hate...); a grandchild's mischievous response when asked about a wrongdoing (Thank You for laughter. 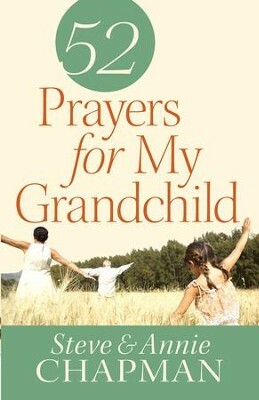 I pray my grandchildren's gladness will be in You...). a bullied schoolboy who discovers home is a safe haven. God, I pray my grandchildren will know love instead of hate, cheers instead of jeers, and mercy instead of judgment. a grandparent’s insights on helping grandkids honor their parents. Heavenly Father, I pray You’ll open my grandchildren’s eyes to how their good behavior blesses others. a grandchild’s response when asked if she’d ripped a page from The Little Engine That Could. “I think I did, I think I did, I think I did.” Lord, thank You for laughter. I pray my grandchildren’s gladness will be found in You. God gives you the amazing privilege of going to Him for your grandchildren. What a blessing! I'm the author/artist and I want to review 52 Prayers for My Grandchild - eBook.